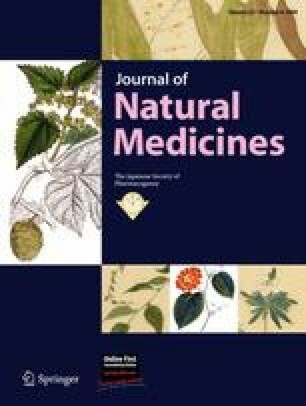 The aim of the present study was to investigate whether an ethanol extract of Gastrodia elata (EGE) rhizome, a traditional Korean herbal medical food, suppresses the endothelial extracellular matrix degradation induced by tumor necrosis factor (TNF)-α. Gelatin zymography results showed that pretreatment with EGE to human umbilical vein endothelial cells (HUVEC) decreased TNF-α-induced increase of matrix metalloproteinase (MMP)-2/-9 activities in the range of 1–50 μg/ml. Real-time qRT-PCR results also revealed that TNF-α-induced MMP-2/-9 mRNA expression levels were attenuated by pretreatment with EGE. These results provide new insights into the pathophysiological mechanisms for the anti-atherosclerotic properties of EGE in vascular diseases. This work was supported by a research grant from the Korea Science and Engineering Foundation (KOSEF) funded by the Korean Government (MEST) (no. R13-2008-028-01000-0).